This will be the last time he wears a hoodie to a photo session in a long, long time. 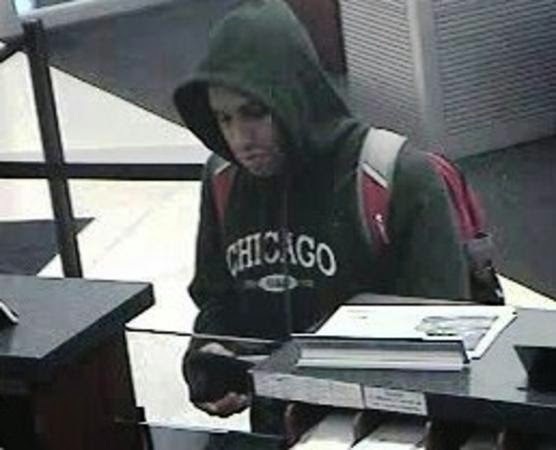 The Benchwarmer Bandit, who held up 6 banks in 30 days, beginning with a Boystown TCF branch, was arrested moments after this surveillance photo was taken during a Loop bank hold-up Tuesday afternoon. Chicago Police and FBI agents homed in on the fleeing bandit by tracking an electronic device that had been secreted in the robbery proceeds. They caught up with him at Chicago Avenue and Wabash. Now, for old time's sake, here's a gallery of the Benchwarmer Bandit's hoodie collection.